Two weeks ago my husband was in a car accident. He was actually in a parking lot and a woman (clearly going too fast) ran into him and totalled his car. He was fine (thank God) but we've been dealing with the annoyance of the accident ever since. We had both cars paid off and no intention of buying a new car anytime soon. So we went back and forth on what to buy. Should he get a small commuter car since the kids rarely go in his car? Should he get an SVU that could fit the kids in it if needed? Should he live out his dreams and get a truck and make his weekly Home Depot trips magical? I said (and honestly meant) that he could get anything that he wanted. I've made it no secret that my next car without a doubt will be a minivan. Knowing that I would need a new car in a few years, his practical side won out on his decision. What did he agree to do? He let me get a new minivan and he's going to drive my Mazda 5. Yup, he's not so bad. So he picked up my new ride last night and brought it home. 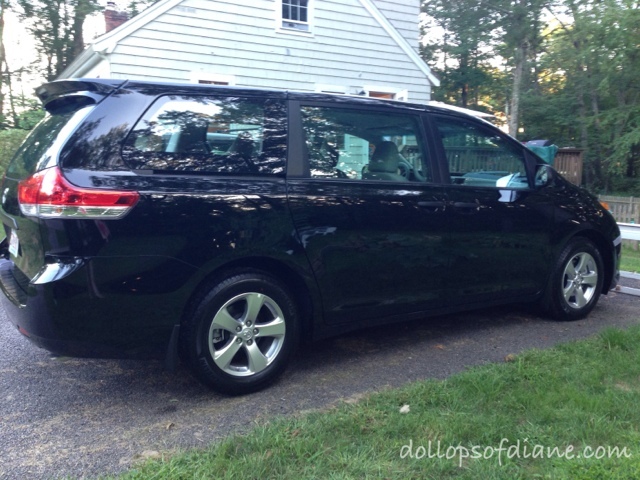 It's a 2013 Toyota Sienna and it's pretty amazing. I went outside to check it out while the kids finished dinner. I sat in it alone and in the quiet and debated if I would ever get out of it. Inside it was the kind of place that my dreams are made of. Shortly after, the kids came out half dressed with dirty hands and faces and jumped like crazy around in "their" new car. My magical moment was gone but it was pretty nice to see them so excited about it. People can say what they want about minivans but gosh darn it I love them. The doors, the space, I just can't get enough of it. I almost slept in it last night.